Invested in a Nintendo Switch? Want to give your handheld/tabletop experience that extra edge? Well, we've got the best and most comprehensive list of accessories you'll ever need. From docks to screen protectors, extra controllers to carry bags, and from headphones to battery packs, this Nintendo Switch accessories buying guide has it all. A screen protector is an absolute must for Nintendo Switch owners, as even the smallest slip or scrape can lead to permanent, ugly damage to the console. Indeed, some people have reported that their console's screen has even picked up scratches from the official Nintendo Switch dock, which just shows that you can't be too careful when it comes to protection. This screen protector from Olixar is one of the very best on the market, boasting a high-tension 9H tempered glass construction, ultra clear finish with a 95 per cent light penetration ratio, and an amazingly thin thickness of just 0.26mm. The fact that the Olixar Nintendo Switch Tempered Glass Screen Protector is also incredibly easy to install, with no risk of bubbles, and also that it rings in just north of fifteen quid, makes this a top tier choice for those looking for some added protection. If you're looking to use your Nintendo Switch mostly as a home-based console, then you're definitely in the market for a Pro Controller. For a start, it's infinitely more comfortable for long periods than the traditional Switch Grip, and while it is a little pricey, its sturdy and far more likely to last than a PS4 DualShock 4 or an Xbox One pad. Working much like a magnetic cover for an iPad or Android tablet, this officially-licensed Hybrid Cover flips over to serve as a sturdy protector for your Switch's touchscreen as well as flipping back to create a stand. With multiple viewing angles on offer (and a cleaning cloth and screen protector bundled in as standard) this one is an easy sell. Nintendo Switch has been made with gaming on the go in mind, so if you're setting out into the wild with your new handheld device in hand you're going to need a great case to keep it safe. The official one comes from Hori, has a sturdy foam build and is big enough to hold your Switch and your Joy-Cons. It even comes with a screen protector. Simple, yet effective. Okay, so we've found you a case to carry your Switch on a day-out basis - but what if you're travelling further afield and need to transport your dock and all your accessories, too? This messenger bag design has a two-in-one function so it can store Switch in both handheld mode and tabletop - it even has a strong shoulder strap for that fashion forward over-the-shoulder look. There are a lot of gaming headsets out there, but not many of them have been designed with Nintendo's latest console in mind. The new LS20 Powered Universal Gaming Headset from LucidSound is a perfect pairing for Switch, offering clean tones, a chunky bass and a comfy fit for those long Zelda sessions. Not convinced? Check out our review for all the in-depth deets on the LS20. With Virtual Console already kicking things off with a selection of classic Neo Geo titles at launch - and what promises to be a strong incoming slate of digital games, too - you're going to need plenty of room to store all that new software. Thankfully, Switch comes with a MicroSD slot so invest in a decent sized one early such as delivered by Lexar's excellent High-Performance 633x MicroSDXC range, which offers sizes ranging from 16GB right up to 256GB (we think a 64GB or 128GB card is best). These cards utlise UHS-I technology too for a super fast transfer speed of up to 95MB/s. You can thank us later. Want to play your Nintendo Switch on the go in tabletop mode, but frustrated how that battery life just isn't enough to see you through long sessions? Invest in a Compact PlayStand from Hori and banish those fears forever - its sturdy design will hold your Switch in place and charge it up. It has three position settings and even folds away. A must have for all travelling Switch fans. This accessory allows you to enjoy Nintendo Switch goodness when travelling, with the Olixar Universal Car Headrest Tablet Mount affixing to any vehicle with adjustable headrests. Installation is simple, with the mount simply slotting over the headrest struts and held securely in place with finger-screwable clamps. 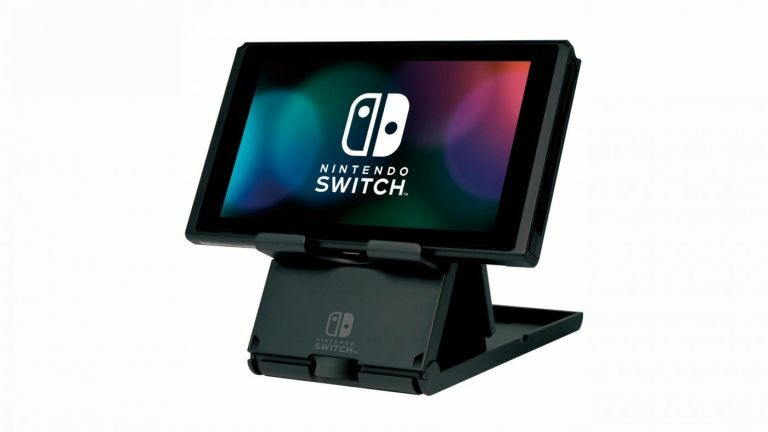 From there the Nintendo Switch - or any other 7 to 10-inch tablet; the dock is universal - can be slotted into the mount's padded grips and then positioned on any angle thanks to the unit's 360-degree ball joint. Keeping the children entertained on long journeys has never been easier or, as the Olixar mount is only just over a tenner, cheaper! Okay, this one's an easy sell. Your Switch comes with a set of Joy-Cons as standard, offering support for both single-player and two player shenanigans. Want to go the whole hog and up the ante to four players? You'll need another pair of clever controllers from Ninty. Plus these Neon Red/Neon Blue ones are great if you've only got the standard Grey ones. We love the 8Bitdo Retro Receiver for NES Classic Edition here at T3, mainly because it enables you to use tons of superior gamepads (including DualShock 4 and Wii Remote) with your NES Classic. Now, the handy little receiver (which plugs into the front of the mini console) has been updated to support Joy-Cons. Now you can use the small yet mighty controllers form your Switch to play some true NES heavyweights. Sadly, the Joy-Con Controller Grip included with your Switch console doesn't actually charge your motion-control peripherals, but this extra accessory does just that. Now, when you're done playing your Switch on the TV, you can slip of the Joy-Cons, slide them down the side of your Switch and walk away with full charge. It's just a shame this wasn't included with your original Switch bundle. By now it's pretty clear you've got some serious love your Nintendo Switch, but what if you're someone who does a lot of commuting or long drives for work? That's potentially hours away from your new beau. No need to worry - use this officially licensed car charger from Hori and you can charge your Switch via USB-C straight from your motor. Just make you've come to a safe stop before you start playing! We're all used to using wireless connections for most of our devices, but not every part of the country of the wider world has the strongrst internet connections so sometimes you need something a little more reliable. Enter the official LAN adapter from Hori - simply connect it to your dock to create a far more stable connection to ensure those online Splatoon 2 sessions rarely stutter. So we know know Switch doesn't have the most robust battery life away from tabletop mode, but that doesn't mean you have to be limited. Investing in a portable charger/power bank is the way to go, and this one from imuto offers hours of extra playtime when connected via USB-C. It's also fairly small, so it won't take up too much space when you're on the move. It can also charge up most smartphones, so it's a very handy device to have on your person. Thankfully, Nintendo Switch supports USB-C rather than a Sony-esque propriety port so any USB-C cable is compatible with it. Here at T3, we like this one from Ugreen - not only is it long enough to support plenty of awkward setups (it comes in 0.5m, 1m and 1.5m versions), its also USB 3.0 friendly, making it perfect for quick charging. An ideal accessory to have whether you're playing at home or planning some Breath of the Wild sessions while out and about.